Little by little I’m uploading data sets from my data base. The latest are tables are the foundation for the Bill James Win Shares calculations that produce the individual evaluations that can also be found on the data page. Team Run Adjustment: Fairly straight forward. A run adjustment of 1.1 means that the parks that team played in over the course of the year appear to have inflated runs scored and allowed by that team (per inning) by 10 percent. 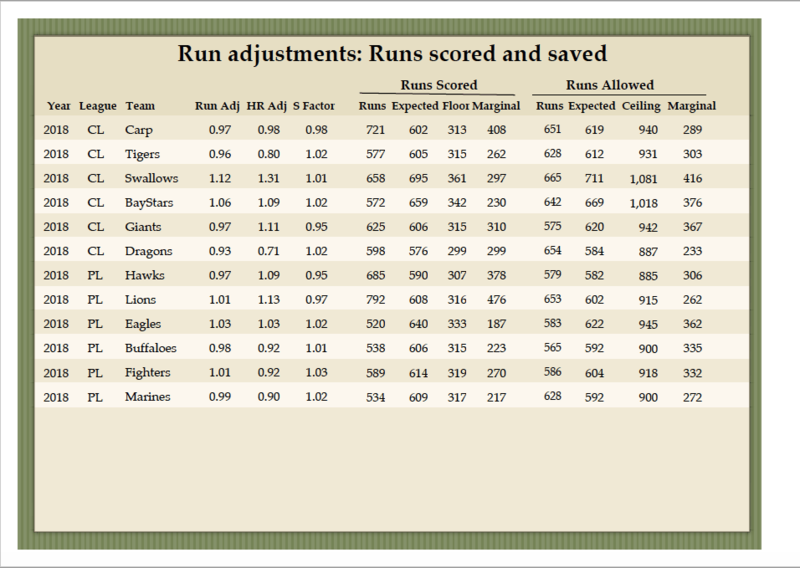 Team Home Run Adjustment: Again fairly straight forward. Team S Factor: This is a measure of how much this team’s parks during the year affected scoring aside from home runs, essentially how easy or hard it is to hit and draw walks there. Tokyo Dome is a classic example of a good home run park, that is a pitcher’s park, because it suppresses singles, walks, doubles and triples. Below is a screen shot of the latest table. The data page is all downloadable PDFs which if you care to you could copy and paste from. I’ll be posting each team’s individual adjustments for this decade, so please check back.